Turn your rear view mirror into a dash camera. 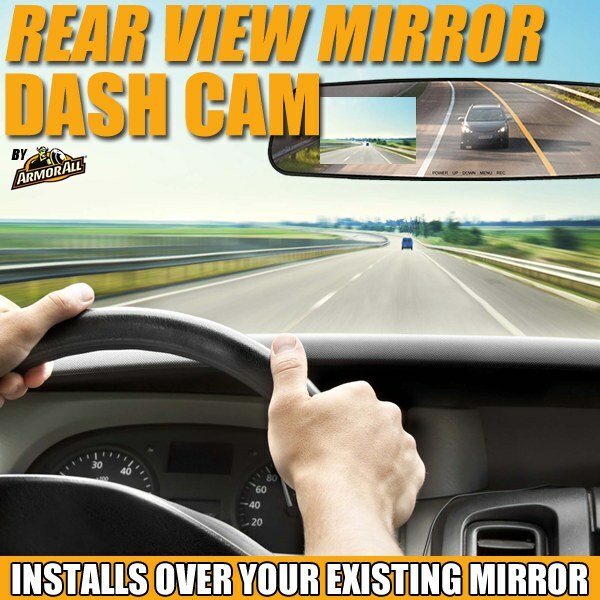 The Rear View Mirror HD Video Camera turn your rear view mirror into a dash cam and easily record (audio and video) what happens on the road when you least expect it. Attaches inconspicuously over you rear view mirror to provide distraction free recording. The split screen allows you to use your rear view mirror and view what is being recorded. Starts recording when you start your car and continues while car is on. Stops recording when no motion is detected. Camera records up to 720p video. Features easy access buttons right on the mirror. Built-in 2.4" LCD color screen directly on the 12"x3" rear view mirro with microphone and speaker. Easy to install simply attach to your existing rear view mirror with expandable rubber clips - no tools required. Car charger plug is included for easy recharging via mini USB. The picture is very clear, a great camera for the price. No problems at all. Worked as expected.